Many Philadelphians say that our streets are littered, we now have the numbers to back up that opinion. 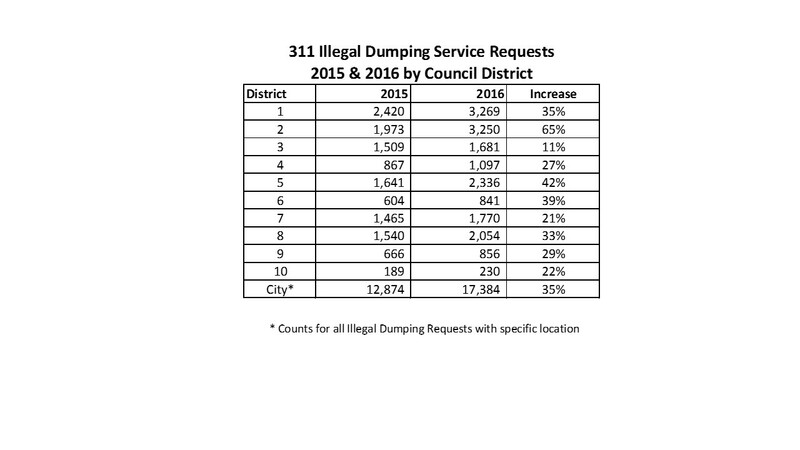 Here’s a comparison of 2015 and 2016 311 Illegal Dumping Service Requests City-wide and by Council District. We had 17,384 in 2016, 35% more than we had in 2015. While Illegal Dumping reports went up in all 10 Council Districts in 2016, Districts 2 and 5 saw 65% and 42% increases, respectively. District 3, on the other hand, only increased 11%. Slide show on how we can use Philadelphia’s OpenDataPhilly 311 data to understand and solve our street trash problem. Philadelphia gets tens of thousands of 311 illegal dumping service requests each year. 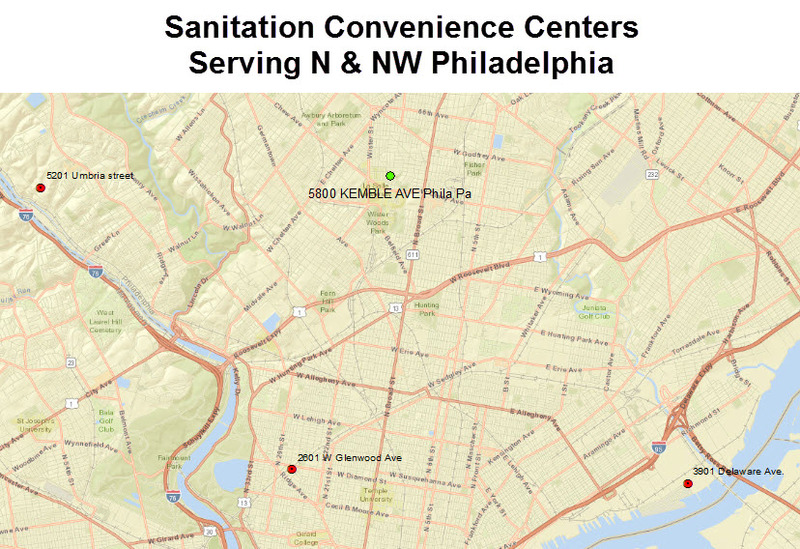 As shown in previous posts, OpenDataPhilly’s 311 service data can provide key information on Philadelphia’s trash hot spots (here, here). In this post, I’d like to walk through how I downloaded 311 illegal dump service requests for the first 2 weeks of December, 2016, identified the requests where residents submitted photos, downloaded the dump photos and then made a YouTube video of selected photos by trash type to show the diversity of dumped material in just this 2 week period. 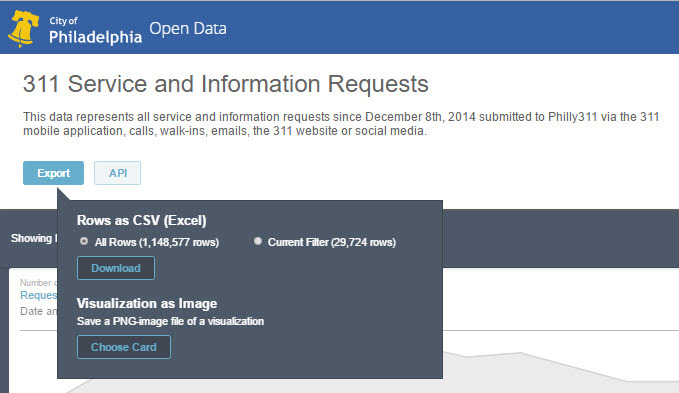 Download each Illegal Dumping Service Request from OpenDataPhilly using R, an open source software statistical software system. I used free, open source – public access resources, including R, Rsocrata, OpenDataPhilly and YouTube. 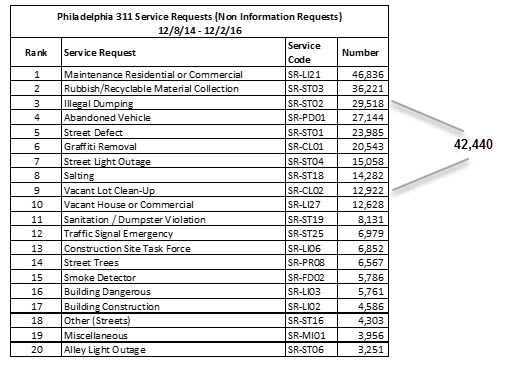 Philadelphians reported 706 dumping service requests to 311 in the 12/1 to 12/14/16 period. 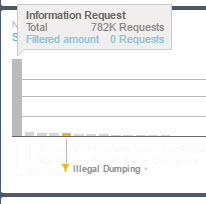 175 of these dump requests included photos, nearly 25% of the dump service requests. In previous posts, I’ve geocoded the dump requests by Council District, neighborhood and street segments to help identify hot spots. Philadelphia neighborhood groups, City Councilors, concerned residents can use the same 311 data to track neighborhood or Council District conditions. Please contact me if you would like more information on how to access Philadelphia’s 311 data to assess problems in your neighborhood. Council Districts 1 and 2 have the highest number of Illegal Dumping service requests, followed by Districts 5 and 8. District 10 has the lowest count, less than 10% of Districts 1 and 2. There are nearly 41,000 street segments in Philadelphia, 71% had no illegal dumping reports, while 46 (0.1%), had 20 or more illegal dumping reports. These high illegal dumping street segments are clustered in several Council District; Districts 2 and 3 had 14 and 11 hot spot segments, Districts 7 and 8 had 6 each. These 46 hot spot segments represent 0.1% of all City street segments and had 5% of all illegal dumping service requests. Users can download a pdf file of the 46 hot spot segments here. Is Philadelphia Winning or Loosing the Street Trash Problem? City’s street trash problem. I have written about it in several previous posts (here, here, here). Philadelphia’s TV broadcast stations 6ABC and NBC10 have both reported on the problem. The City has been fighting street trash for years. Penn Future’s Next Great City identified trash as one of the major priorities in the 2015 mayoral election (link). So how is Philadelphia doing in our efforts to “clean-up our City”? Good question, unfortunately we do not have a clear, valid answer. Philadelphia has several programs to tackle illegal dumping, including the Streets Departments 6 Sanitation Convenience Centers, 311 illegal dumping service request responses and the Community Life Improvement Program’s (CLIP) vacant lot clean-ups. 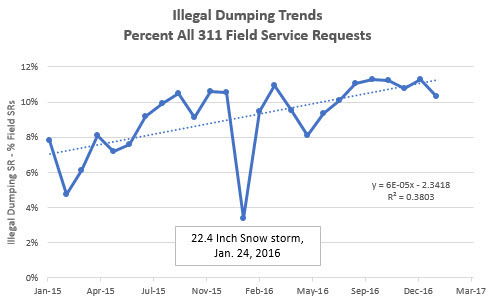 Let’s take a look at the 311 Illegal Dumping and Vacant Lot Cleanup service requests trends to see how often our citizens report street trash issues. The trend does not look good. We clearly have a seasonal trend, with higher number of requests in the summer months and lower 311 calls in cooler months. The 2016 fall numbers are considerably higher than the fall, 2015 call count. My personal observations of District 8 trash hot spots indicate indicates that as soon as the City cleans up an illegal dump, it is re-trashed. 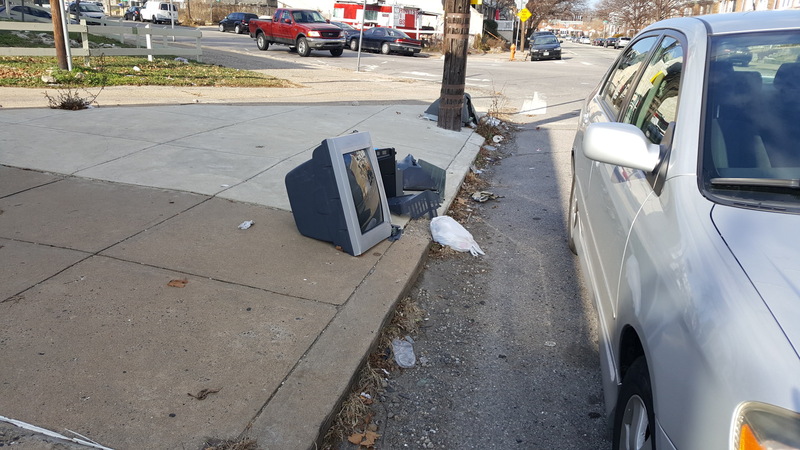 Clean-ups are essential, however, we must increase our prevention efforts if we hope to slow the illegal dumping wave that is filling many of our streets and vacant properties with trash. Why is Illegal Dumping So Critical to Street Trash Control? Illegal dumping control is absolutely critical to an effective street trash control. Dumping is so rampant that many City agencies and others avoid proving trash receptacles in highly littered locations because past experience has taught them that trash receptacles are often attract residential and construction trash dumping. Residential trash dumping does not make sense in a City with “free” weekly residential trash collection. yet we see residential trash across our City. Residents can bring bulky items to one of the 6 Convenience Centers, yet we see many bulky trash items left along our roads. I ask the Mayor and City Council to re-assess our street trash programs and see what we need to do to increase dumping prevention efforts, including increased camera and police surveillance in known trash dumping areas.